The most powerful Microsoft Access database documentation and analysis program is now available for Microsoft Access 2019 (Office 365). Total Access Analyzer supports all the features of Microsoft Access 2019 with additional enhancements from the 2016 version to extend its functionality and improve its use based on our experiences and customer feedback. Microsoft Access 2019 is available as a perpetual license or part of the Office 365 subscription, now called Access 365. 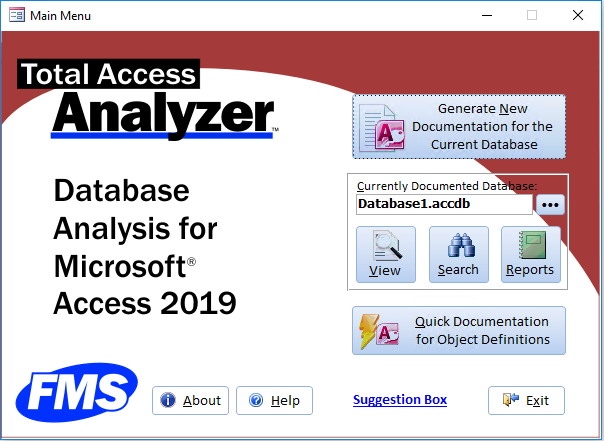 Total Access Analyzer 2019 includes a 32 bit and a 64-bit version of its add-in to support both versions of Microsoft Access 2019. The setup program automatically detects the Access 2019 version you've installed and installs the appropriate one. It supports any operating system (32 and 64 bit) that Access 2019 supports. It also understands and documents the new object types like graphs. This means you can use Total Access Analyzer 2019 with Microsoft Access 2019 to document and analyze databases created by older versions of MS Access.